Govan Cureton is an African American who is the son of Ambrose and Eliza (unknown) Cureton. Govan was born between 1865-1871. I have seen him in several different locations and dates for his birth. The quest is to determine where Govan Cureton was actually born; was he born in Tennessee, South Carolina or North Carolina? 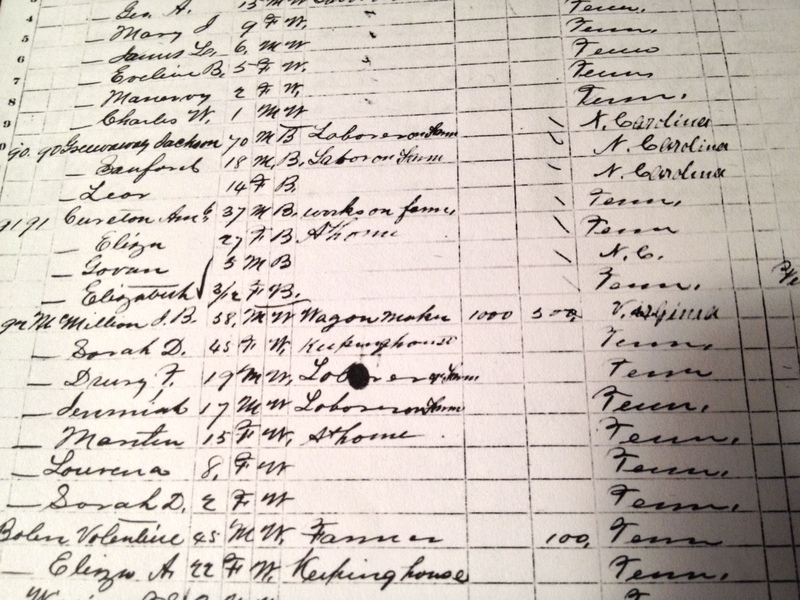 What documentation as a genealogist should I rely on? We all know the difference between primary and secondary sources. I drafted a timeline on Govan listing everything in date order. I first began simply writing down what I know about my great grandfather Govan. My intentions were to locate as much information as I could to provide evidence to determine where he was born. A good way to begin is reviewing the federal population census. 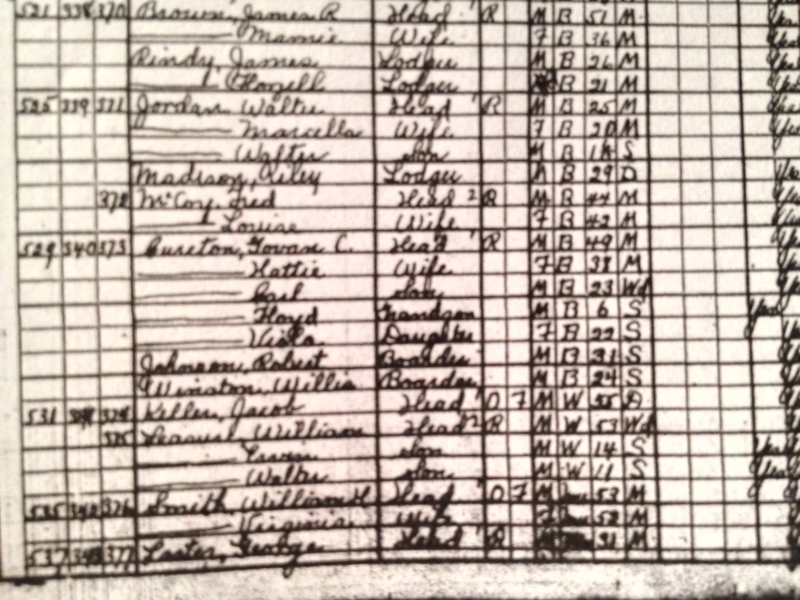 The first one I found listed Govan in the 1870 Federal Population Census for Cocke County, Tennessee. 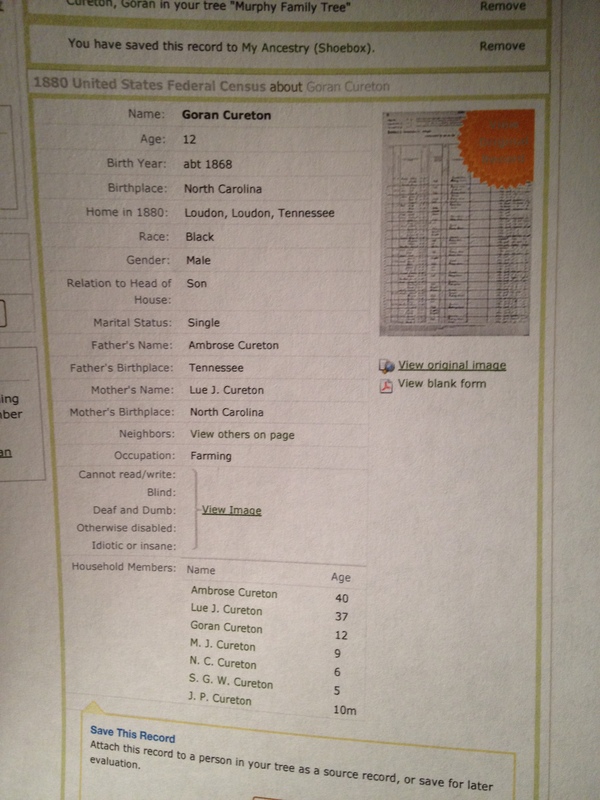 Govan is listed as a 5 year old in the household of Ambrose Cureton and Eliza Cureton and it says he is born in North Carolina. The census also listed a sister (an assumption) named Elizabeth. 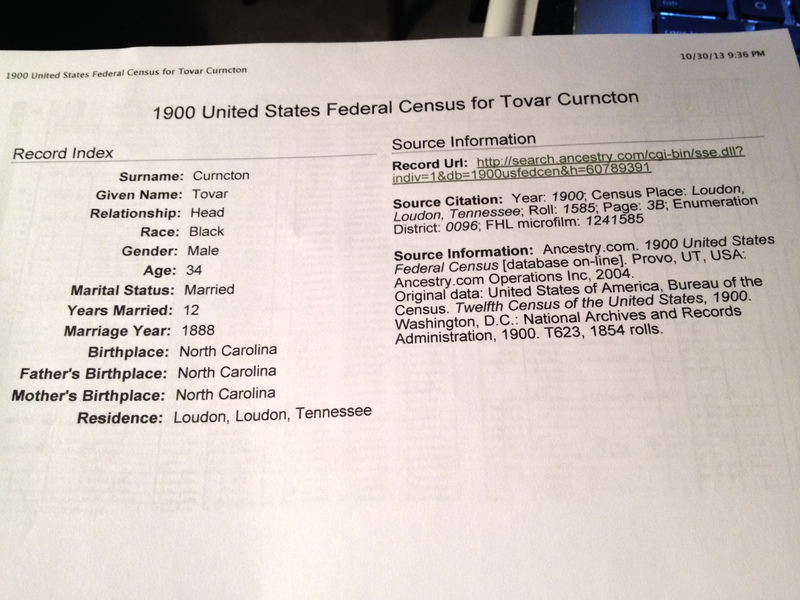 1880 Federal Population Census (1880; Census Place: Loudon, Loudon, Tennessee; Roll: 1267; Family History Film: 1255267; Page: 357B; Enumeration District: 213.) Govan is in the house with his father and stepmother and siblings. I love the challenge of figuring out the name of the children in this household -all of them; except for Govan have initials for their first names. Govan is listed as being born in North Carolina, now being born in 1868. 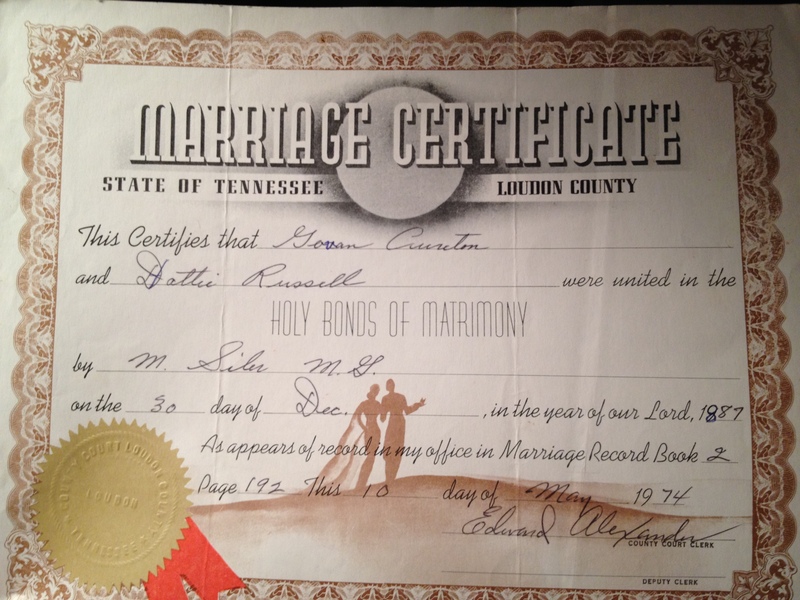 1887 Marriage Record “Tennessee, State Marriage Index, 1780-2002” Govan marries Hattie Russell, daughter of Anderson Russell. They lived in a houseboat in Loudon County, Tennessee. 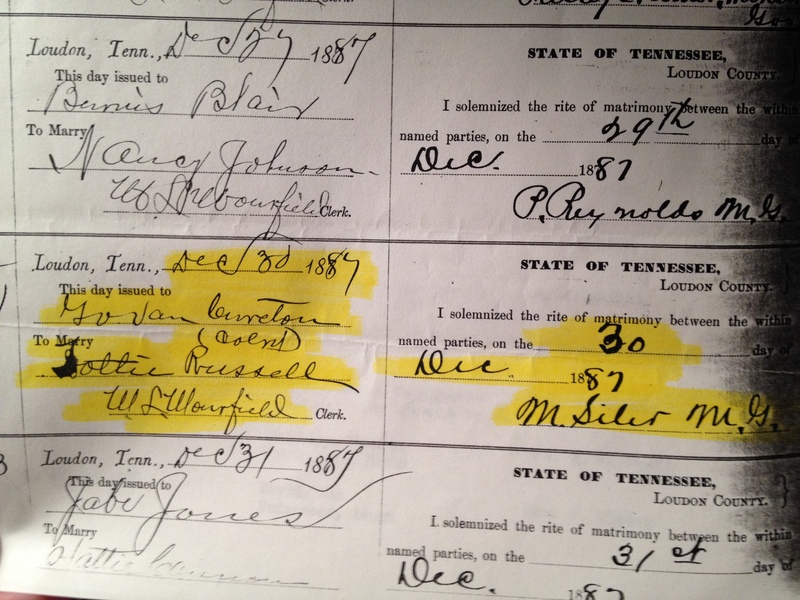 1891 Voter Tennessee, Compiled Census and Census Substitutes Index, 1810-1891 about Govan Cureton. 1910 Federal Census Knoxville, Knox County, Tennessee-So Govan and his family has moved to Knoxville, why, there could be various reasons. Govan is head of the household, now born in Tennessee, wife Hattie, Carrie, Viola and two boarders; Clifford & William Graham. So far it appears that the Cureton’s moved to Ft. Wayne sometime in 1917. 1920 Federal Census Ft. Wayne, Allen County, Indiana. Govan is head of the household, wife Hattie, son Carl, grandson Floyd, daughter Viola, Boarder Robert Johnson and Winston William. Govan was a janitor at the Court House. 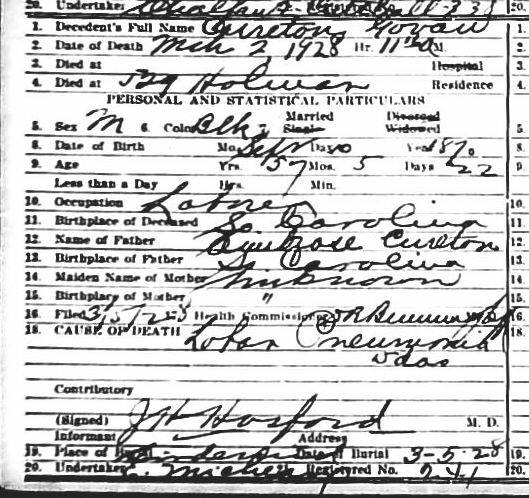 Another note-Govan’s son, Carl was married to his second wife in 1924 in Allen County, Indiana, he lists his father as being born in Norfolk, VA. Now where did that come from? 1928- Govan Cureton passed away 2nd day of March, Ft. Wayne, Allen County, Indiana. 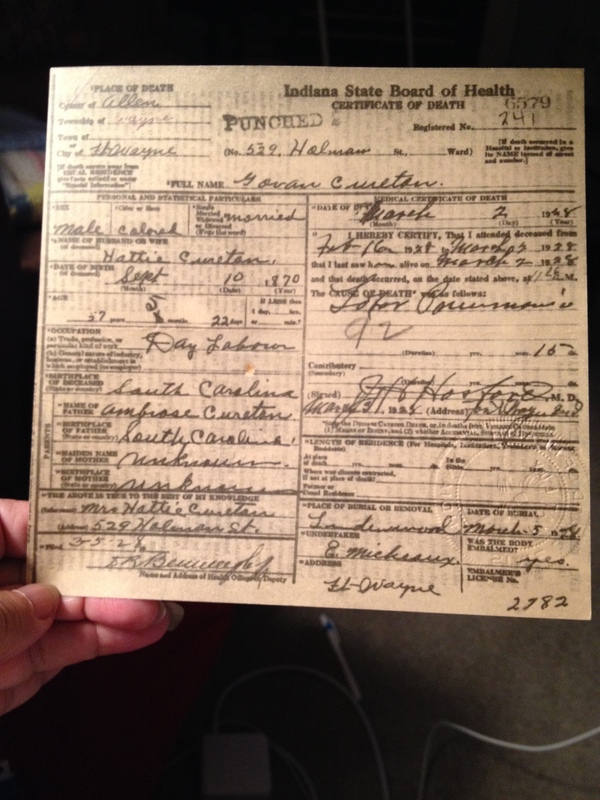 Note he says Govan was born in South Carolina and Govan’s wife Hattie is the informant and he died at 529 Holman St. 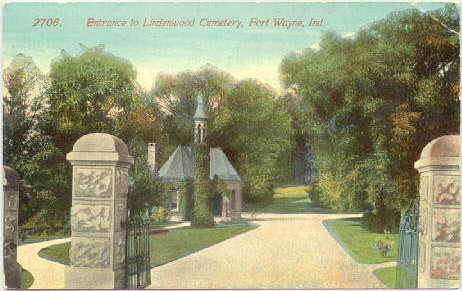 While attending the International Black Genealogy Summit (IBGS, 2009) in Ft. Wayne, I pulled this Obit from the Ft. Wayne newspaper (Allen County Public Library, Genealogy room) and visited the cemetery where Govan was buried. Note that he is now born in Greenville South Carolina (I was so excited). In the local newspaper the following Obit was listed. This provided personal information on Govan such as being a member of the Mt. Olive Baptist Church (where my grandfather William C. Murphy, was an Associate Pastor. William married Viola, Govan’s daughter), he was a member of the American Woodmen and he had a sister name Stella Thomas and “one” brother William from Cincinnati, Ohio. This is a cemetery record, note birthplace of Govan is South Carolina and birthdate now is 5 Sept 1870, and his father was born in South Carolina and Govan’s mother is unknown. There is no indication of who provided this information, but it is assumed Hattie provided it. In addition, to locating the obit and visiting the cemetery I visited the African, African-American Historical Museum (http://www.myblackinfo.com/african_americanfw.htm). At the museum I found some journals by William E. Warfield. The museum website says there is a William E. Warfield Room and “Mr. Warfield, a leading citizen of the community, published the first Black Newspaper in the city called Fort Wayne Weekly Vindicator. He named the Indian Village Addition (west of Brooklyn Avenue). He kept diaries for 27 years. The museum has the complete set of these diaries, which contain accurate information of the day-to-day account of local events, from 1909 to 1936″. Here are my notes from Mr. Warfield journals on the day my great grandfather passed: ” Friday, March 2, 1928, Mr. Govan Cureton died this morning in Mr. Collier’s house on Holman Street and Mrs. Cureton will move I suppose he will move back into his own house. 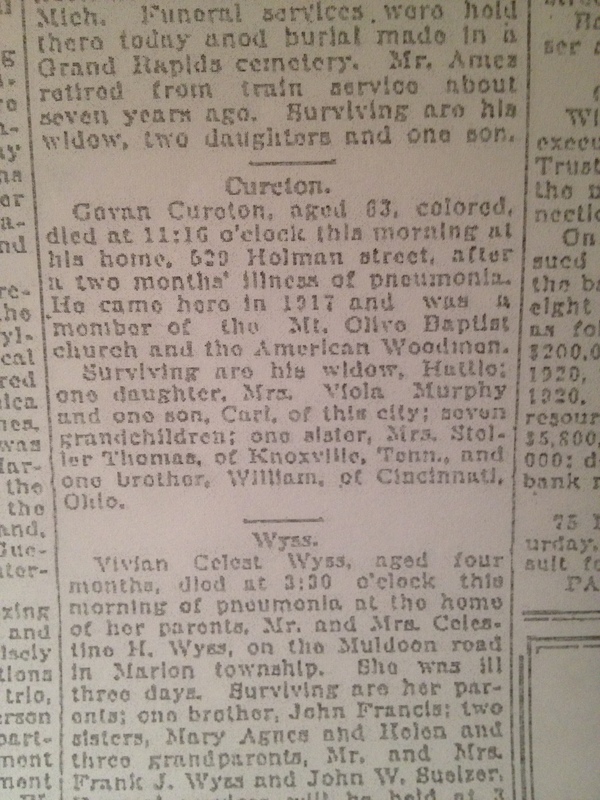 Monday, March 5, 1928, Mr. Govan Cureton was buried this afternoon from Mt. Olive Baptist Church, Rev Pugh officiated. While surfing one evening I located a death record. Finally! It is a death record for Jenny Mable Cureton (Jennie), she is the daughter of Govan according to the death record. We only saw her in the 1900 census. My mother (Verna (Worden), says Mother Vi (short for Viola Cureton) who is my father’s mother said she had a sister who died as a teen, but did not remember her name. Per the record Jennie was born in 1910, and was 17 when she passed. 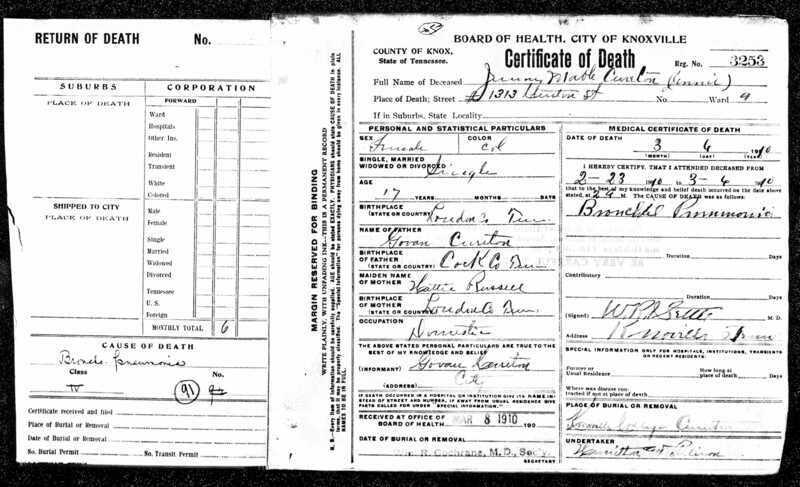 The death record states that she was born in Loudon County, Tennessee. Noting who was listed as her parents I knew it was the same family. As we learned at Midwestern African American Genealogy Institute (MAAGI) in St. Louis in the Methods and Strategies Track, as researchers, we have to analyze all records. We understand that records create other records. We had fun with a short drill of “Murphy’s So What” concept using a Death record. The record literally was picked apart, section by section and asking each piece of information-“So What”…asking to what good is this information, how will it help me, is it telling me where to go next? This allowed us to begin drafting a research plan. 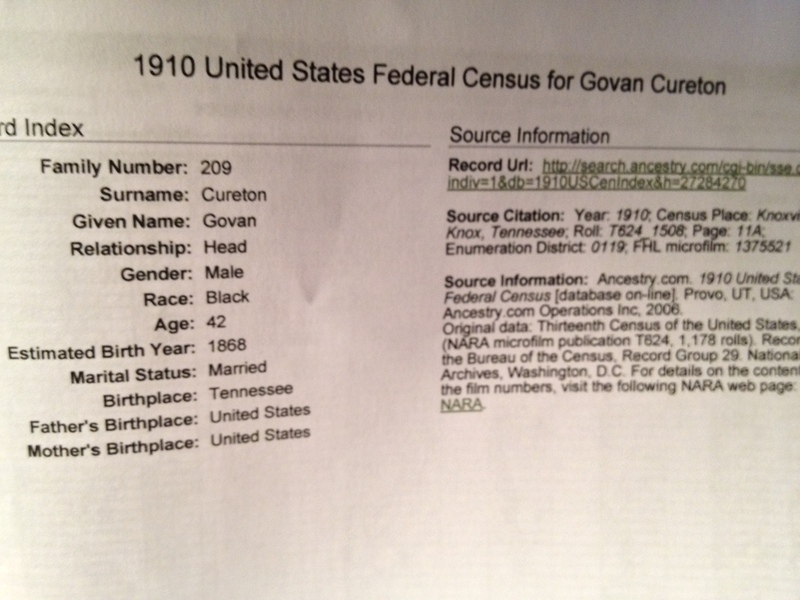 Based on this document I believe Govan was born in Cocke County, Tennessee-why, because he was the INFORMANT. I can safely say he should of known where he was born, better than his wife. Some take aways; it is a must that genealogist research the whole family, not just the head of the household. The references to South Carolina and North Carolina could actually be where his father might of came from? It is necessary to research the whole family. A little bit of oral history as I remember from my Uncle Carl Cureton (Govan’s only son) that Govan’s father, Ambrose, was a 9 year old slave child when he arrived in America, arriving in one of the Carolina’s. He came from the French West Indies. He says a Cureton family brought him and they relocated to Tennessee. Bottom line, I have lots more research to do on this line, locating daughter Carrie and siblings of Govan, I have no indication of a brother named William. Also, is there a death record for Eliza Cureton, Govan’s mother. I would also love to see a picture of Govan Cureton. 1 Response to What’s the Evidence? Determining where Govan Cureton was born!